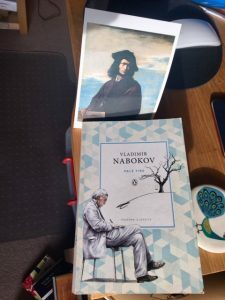 This entry was posted in American Literature and tagged Alexander Pope, Brian Boyd, John Shade, Kinbote, Laurence Sterne Tristram Shandy, OED, Pale Fire, Penguin Books, Samuel Johnson, TS Eliot, Vladimir Nabokov, Zembla by Simon Lavery. Bookmark the permalink. Thanks, Karen. Yes, it’s complex, but enjoyable at many levels. I gave up on the clever stuff – left that to the academics. After all, it is partly a satire about academic preciosity. Oh no, the clever stuff is worth it. The clever stuff is astounding. There are no “dead ends” in the book. There are some circles. Where are the Crown Jewels hidden? I think this is one of the greatest novels ever written, for what that is worth, a standard by which I become discontented with other books. (I am paraphrasing an amusing but of Ezra Pound I just read, there). It contains some of the finest difficult pleasures I have ever come across. It’s an extraordinary experience, reading this novel. Nothing else like it. To my shame, I’ve never read anything by Nabokov, a definite gap in my reading over the years. One to work up to, perhaps? It does sound fascinating, though – multilayered and labyrinthine in nature.